Lola (Maribel Verdu, Pan’s Labyrinth) is a single mother whose young son, Tristan, “Tris,” (Joaquin Rapalini, Las Ineses) has autism. Hoping to find a “cure” for Tris’s condition, she makes the long voyage from Spain to the remote region of Patagonia. Roberto “Beto” Bubas (Joaquin Furriel, To Steal from a Thief) is a ranger assigned to a lonely lighthouse that overlooks the Atlantic Ocean where orca pods gather. Beto has gotten into trouble for inappropriate contact with the whales (touching them is illegal) and his supervisor Bonetti (Osvaldo Santoro) has threatened to transfer him from the post that he loves for deep-seated reasons that are revealed much later in the film. Beto’s tranquility is disturbed when he finds Lola and Tris asleep on the porch of his very humble cabin. After the ranger reluctantly wakens the exhausted mother and her child, Lola explains the reason for their visit. Apparently Tristan became “emotionally engaged” with a televised National Geographic documentary of Beto and the orcas, and she believes that interacting with these creatures will somehow help her son’s behavioral problems. Beto discourages them from staying with him but after reading up on autism, he has a change of heart and welcomes the pair back to his cabin. There Lola experiences life in the “wild” with makeshift cold water showers and a restroom en aire fresco. Beto asks Bonetti for permission to take Tris to visit the orcas, claiming that it will help his autism, but his request gets denied. Not to be deterred, Beto takes Lola and Tris out on his row boat and they have their first encounter with Beto’s favorite orca, Shaka (all of the orcas have their own names). Gradually, the bonds begin to form between these three characters and, as their unlikely story proceeds, the magic of this quiet film begins to unfold in earnest. There are literal and figurative plot bumps on the region’s numerous unpaved roads as The Lighthouse of the Orcas gradually moves toward a bittersweet denouement. Along the way, we are treated to great scenes between orca and human that provide a rare view of how one species communicates effectively and emotionally with the other. A trio of scriptwriters, Gerardo Olivares, Lucia Puenzo, and Sallua Sehk, have adapted Roberto “Beto” Bubas’s book, based on real-life events, and deliver a somewhat predictable plot yet one that presents a moving and very personal story of three people. Among this film’s heroes is cinematographer Oscar Duran (Little Men) whose cameras deliver sweeping vistas of the Patagonian coast, the vast expanse of ocean, and the orcas that inhabit it, while prolific soundtrack composer Pascal Gaigne contributes a lush score that constantly tugs on our heartstrings. The principals, film veterans Verdu and Furriel, turn in their compelling performances of two very different people who gradually become quite intimate. What really resonates is young Rapalini’s spot-on capture of the idiosyncrasies of an autistic boy, down to the totemistic glove that he continually wears and the mute gestures that he generates. Ana Celentano’s pregnant villager Marcela, a Patagonian convert, adds a nice dramatic foil. The Lighthouse of the Orcas is a beautifully done film that will grab its audience and not let it go until the end credits bring them up to date on the real Beto and his orcas. Be sure to keep a few hankies near by as you will surely need them during the film’s final scenes. Highly recommended and now available for viewing on Netflix. 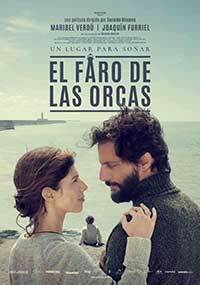 A beautifully done and very sentimental Spanish/Argentinian film that treats the subjects of autism and man's relationship to orcas with a deft touch.